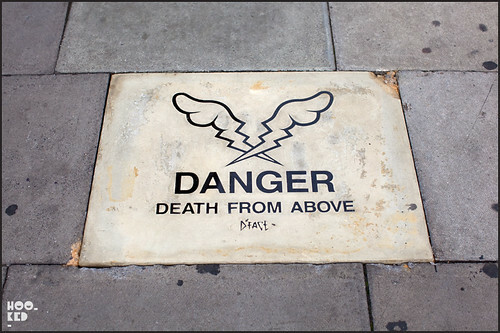 Earlier this month saw the appearance of this concrete Danger: Death From Above paving slab from London based street artist D*Face on Hanbury Street, just off Brick Lane in East London. 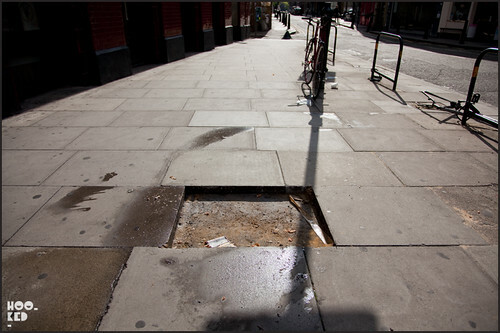 The work created by the street artist in his studio was installed in the street, replacing a loose paving stone that was removed by the artist to installed his cast concrete work in its place. This concrete street work by D*Face lasted less than 48 hours before a fan/collector literally stole this piece of the street. When we passed by the location for a second time we found the heavy concrete artwork had been removed. You can watch the short video of artist D*Face and his assistant creating and casting the piece in his studio and then the two installing the piece in the street. D*Face Goes Large. D*Face hits Tower Bridge, London. this was stupid by Dface. Obviously it was going to get stolen, leaving a big gap in the street.